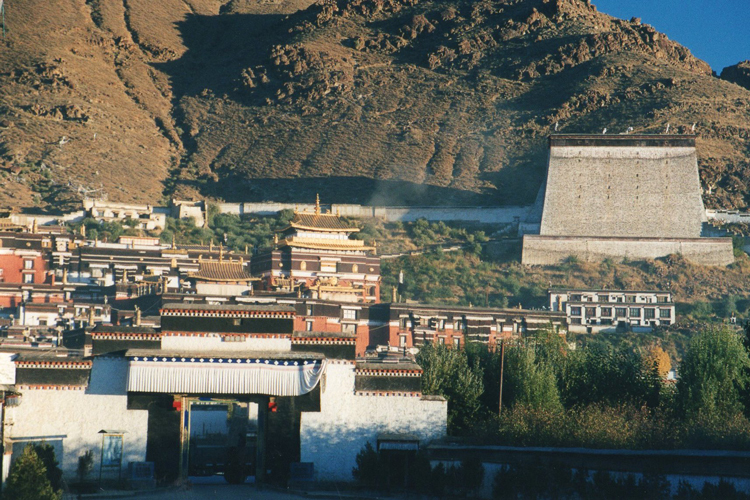 Outstanding koras sacred circumambulations around Tibet's greatest monasteries: Ganden on its mountainside above the Lhasa valley, and Tsurphu, nestled in a deep valley to the northwest of Lhasa; the Panchen Lama's Tashilhunpo in Shigatse and Labrang in China's Gansu province. Wherever you go in the Tibetan world, you will find koras, the circumambulations around places of spiritual significance, from the heaps of stones you find at junctions and passes, to monasteries, lakes and even mountains, the king of them all being the trail round remote, mysterious Mount Kailash in the far west. A kora is always a moving place, with ancient, frayed prayer flags spanking in a whippy breeze and pilgrims plodding determinedly, muttering mantras and turning their prayer wheels. It is a spiritual journey involving prayers, prostrations at key places and even crawling the route, actually an endless series of repeated prostrations, with pads on knees, elbows and hands to stop their destruction. The longest koras take several days to walk, Kailash some 50 days to crawl. As you approach any Tibetan pass, the spiritual will make itself known. There will be a pile of stones, ranging from a middling cairn to a house-size heap of the deposits of centuries, often topped with horned skulls. You must walk round it clockwise if a Buddhist, anti-clockwise for followers of Bn, the ancient shamanistic practices of the plateau muttering a mantra and adding your own stone to the slowly growing pile. At the great sites the grand monasteries, temples of Lhasa, Lake Manasarovar, ineffable Mount Kailash you will be in the company of pilgrims who have travelled often walked hundreds of miles, possibly across the Himalayas to make a lifetimes spiritual journey: rough nomads from the Tsaidam basin in the north; becoralled villagers from the edge of China proper with their snow leopard trimmed coats hanging away from one shoulder, long haired, their womenfolks elaborately braided, and daggers and magnificent curly-toed brocade-decorated boots the mens favoured accessories; pilgrims, including Hindus and Jains from the plains of India, cold and sick in the high, thin air. Tibet's ancient mystique as an inaccessible, uniquely other-worldly mediaeval theocracy still survives, if under attack from the versions of modernity imposed by China and imported (forgive us) by tourism. 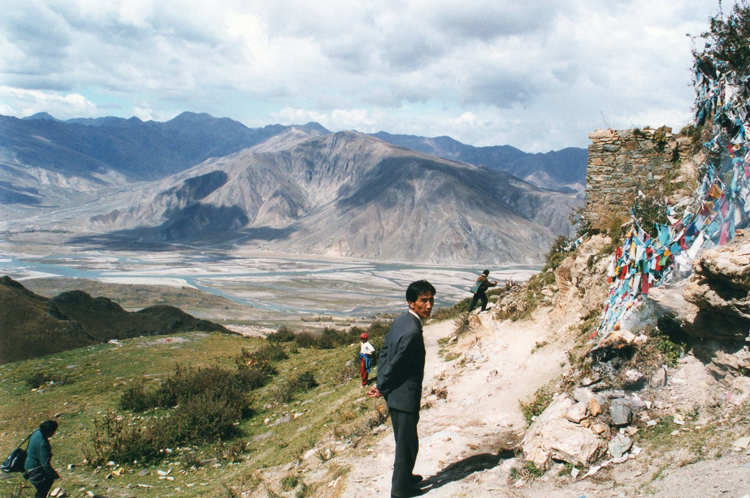 The first organised westerners to reach Lhasa were the Younghusband expedition, and they had to fight their way there. Tourists from China, Japan and the West now arrive daily by the planeload. The Han Chinese now control everything and dominate the cities. 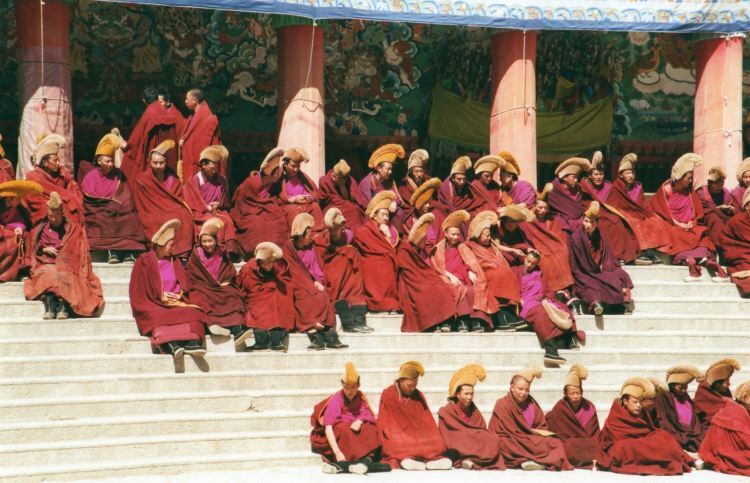 It will not be long before the Tibetans are a minority in their own country. Almost all monasteries and temples suffered grievously during the Cultural Revolution some completely destroyed, great Ganden famously through shellfire. Many have been Disneyficatorily restored, and are crawling with spies in monks clothing. Your best chance of feeling the true spirit of the old Tibet may well be on a kora. These monastery koras are outstanding in their own right and are separately described in detail. However, for the purposes of compiling our Top 100, we have put them together as they have fundamental similarities, and very few people will have the time (or, given the altitude, energy) to get round them all. Here are some of the greatest of the koras. These walks are not inherently difficult (although Tsurphu invokes some slog), but they are all high. Hidden high on a mountaintop above the Lhasa river, east of Tibets capital, sits the great Ganden Monastery, rising phoenix-like from its own ashes. Its setting is extraordinary, nestled around a semicircular bowl at the head of a small side valley between a hill and rough, lonely mountains; the kora gets the full benefit of this drama. 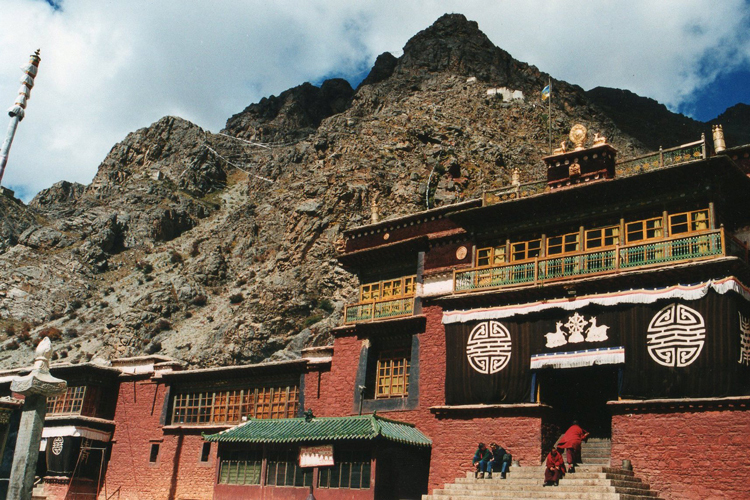 Tsurphu, the mother monastery of the Karmapa (Black Hat) branch of the Kagyupa order, is perched at 4,480m up a beautiful valley, some 70km north-west of Lhasa, beneath crags speckled with precarious meditation retreats. 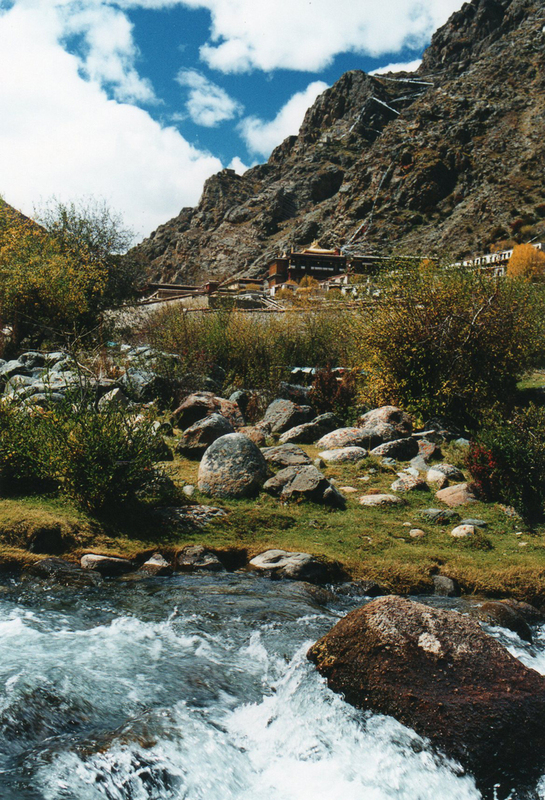 A stream rushes between brilliant green banks and boulders, below prayer flag streamers which cross the narrow valley. It has possibly the most dramatic of all monastery koras. Samye, Tibet's oldest monastery, with a history of over 1,200 years, lies in a sandy valley on the north bank of the mighty Yarlung river. The monastery is remarkable - built inside a high circular wall on a plan modelled on a mandala, a Buddhist representation of the universe. The kora is interesting enough, winding outside the monastery walls, but the climb up Hepo Ri, a sacred hill to the east with predictably wondrous views, is not to be missed. 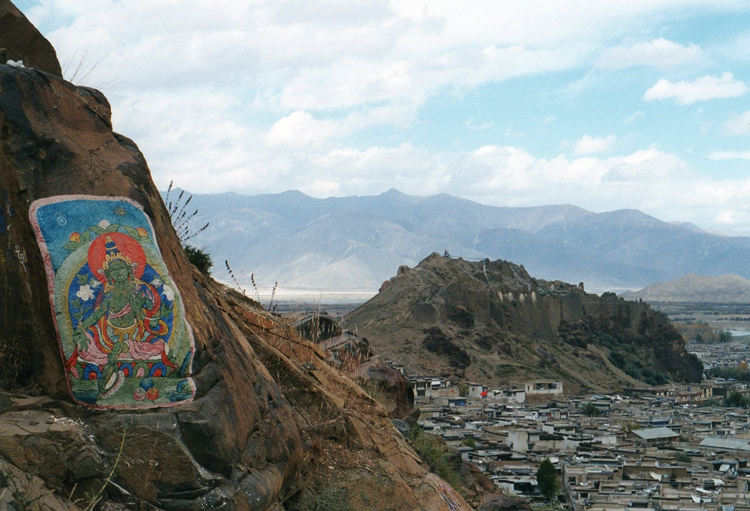 At the heart of Shigatse, Tibet's second city, lies the great Tashilhunpo Monastery, seat of the Panchen Lama, Tibet's second most senior cleric, and once home to thousands of monks. 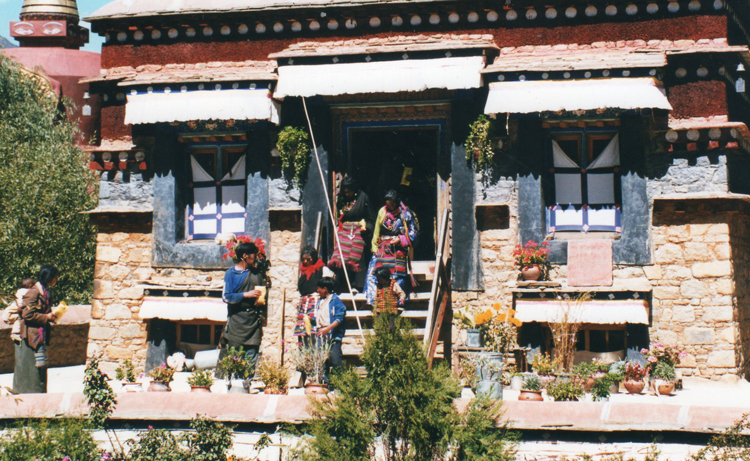 The views across the monastery and town from the kora on the hillside above are on their own worth coming for. Look out for the enormous Thangka wall. 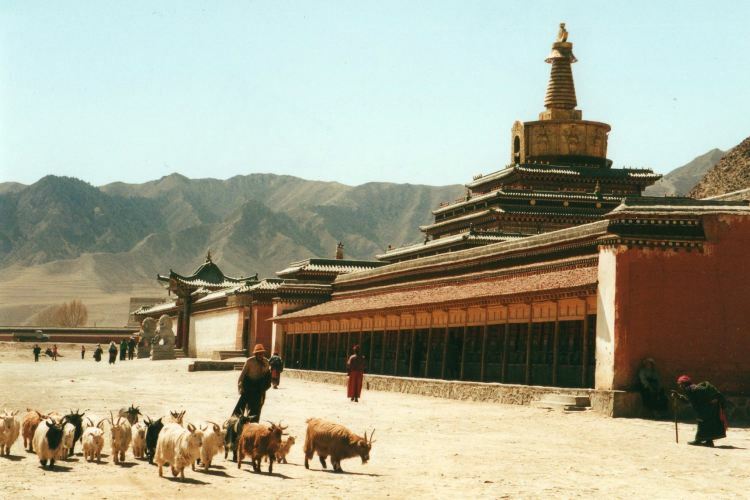 Labrang Monastery, said to be third in the Tibetan world and once home to over 4,000 monks, is vast and feels decidedly underpopulated despite still housing well over 1,200 monks. 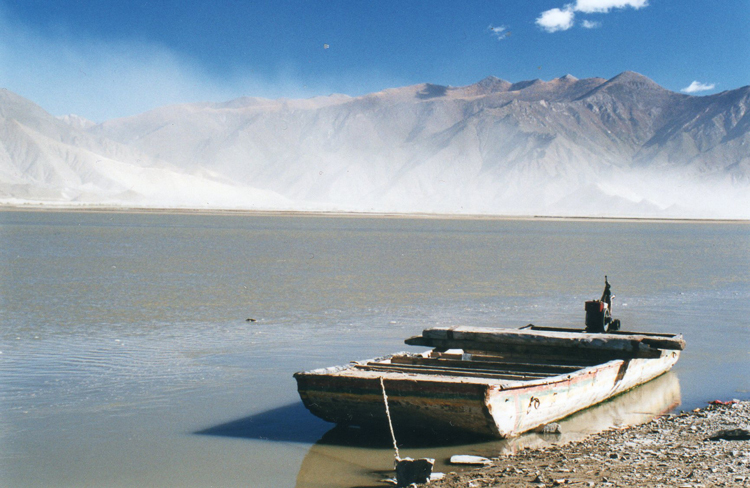 Labrangs kora winds for over three thrilling kilometres around this huge monastic site. The metropolitan sophisticate among koras, the Barkhor Kora in Lhasa circuits Tibet's holiest temple, the Jokhang, winding through the effervescent, idiosyncratic streets of the Tibetan quarter of Lhasa, thronged by a wondrous array of pilgrims from all over ethnic Tibet. As short as a major kora can get, it still contrives to take the best part of an hour to get round it. 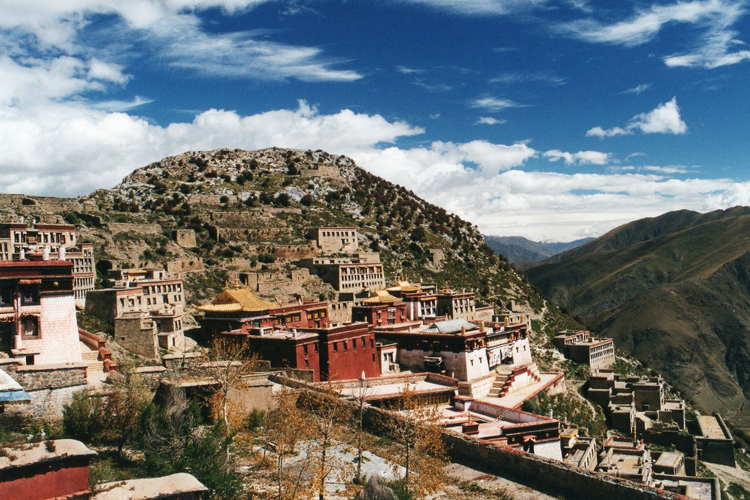 While in Lhasa, you may want to walk part of the kora round the Potala Palace, Tibets best-known building and the ancient seat of the Dalai Lama, although much of the route is now in sprawling, modern Lhasa and commensurately atmosphere-reduced. There are endless koras in Tibet they are endemic. You will find one at every sacred place you go. 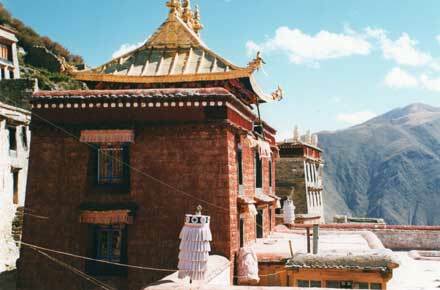 Other fine monastery koras include Sera and Drepung on the outskirts of Lhasa.